What does 'spring ahead' mean to you? To me the changing of the clocks means that I will be miserable for about a week. No joke. My mom says that since I was little the time change has thrown me off for a week solid. Ok, so I've grown up and it's more like 3 days now! My internal clock is pretty reliable. It gets me up at 6:50am every day whether I set an alarm or not. This comes in very handy if I forget to set an alarm. It gets confused this time of year though. I force it to reset which means I feel all out of sorts for a few days. On the plus side, I get more daylight. I get more done after the kids get home and more playtime with the kids and critters! 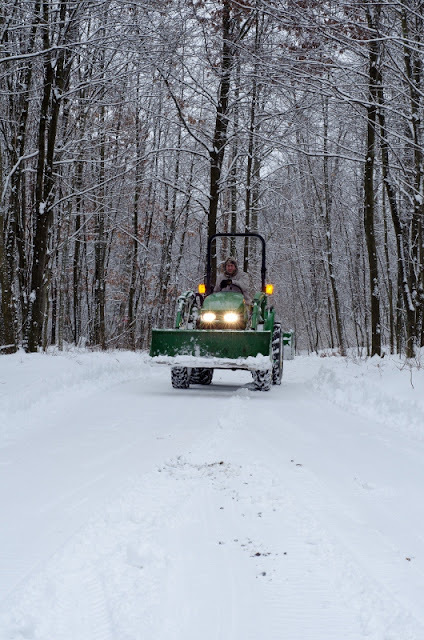 It means we should be just about done with the white fluffy stuff and hubby can till gardens with his John Deere instead of plowing the driveway with it. It means flowers and baby chicks and......oh crap, I forgot to plant those bulbs! Now where the heck did I put them?. It means I can get back to what I really love to do....with my camera, and my chickens and people. Oh the people! People at swaps and at shows and at weddings. It means that Buddy the Silkie rooster better amp up his training if he's going to debut his leash walking talents at the next show. Lol YouTube here we come! It means less baking and more grilling. Windows open and heaters off. Sunshine, t-shirts, daffodils and quad rides through the mud. I am so ready to 'spring ahead'! Are you? I completely agree! I've been loving being surprised at 5pm - feels like 3pm and now I've got bonus time!